Rudy Gobert: What more must Utah Jazz center do to make an All-Star game? Utah Jazz centre Rudy Gobert did not make the All-Star Western roster despite a career-best season. What more does he need to do? Amid the unexpected news of the trade that sent Kristaps Porzingis to the Dallas Mavericks, January 31 also saw the announcement of the 2019 NBA All-Star Reserves. Such things are never without controversy. There will always be at least one fan base aggrieved that their guy did not make it in, no matter how much diplomacy is employed in the selection process. Given that there are invariably fine margins involved in the decisions at the bottom end of the rosters, there is often some validity to these claims. The main such case this season appears to be for Utah Jazz center Rudy Gobert. 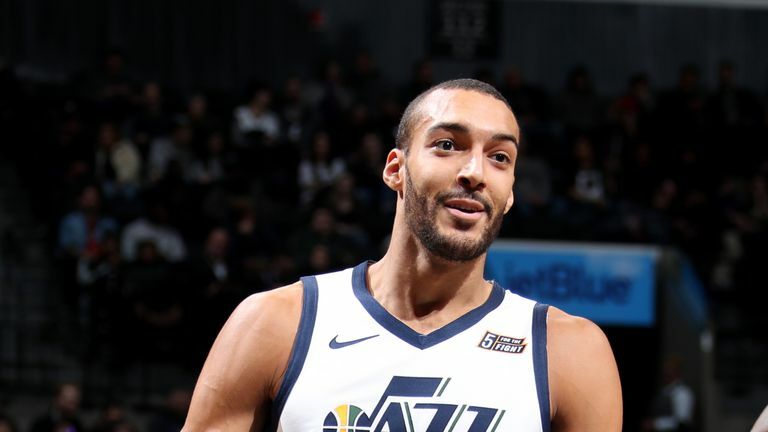 Having not made the Western roster despite a career-best season, Gobert cried while talking to the media, fuelling the fires of both criticism and support for his own candidacy and the selection process. In part, those tears are likely because not making the All-Star game cost Gobert a $1m bonus in his contract. Deny me a million dollars without explanation, publicly, and I would cry too. Mostly, though, the frustration comes from not knowing what else he needs to do. On the season, Gobert averages 15.1 points, 12.8 rebounds, 2.2 assists and 2.2 blocks per game. The French international, known affectionately as 'The Stifle Tower', is playing as good denial defense on the interior as ever, serving as the anchor to the NBA's fifth-best defensive unit; he is also, let us not forget, the reigning Defensive Player of the Year. He scores on minimal touches, too, taking only 8.6 field goals per game, 7.8 of which see him hold the ball for less than two seconds before shooting, most of which come as the league's best roll man. Therein lies the crux of the clamour. Gobert is extremely good at what he does, and he does quite a lot. Put it this way; Gobert is second in the league in win shares, a metric designed to be a catch-all measure of how much impact a player makes to the outcome of games. The rest of the top 10 reads: James Harden, Giannis Antetokounmpo, Paul George, Anthony Davis, Nikola Jokic, Kevin Durant, Damian Lillard, Karl-Anthony Towns and Kyrie Irving. That is to say, nine other All-Stars. To keep that kind of company and not be deemed worthy of the same accolade is jarring. By way of comparison, Golden State Warriors shooting guard Klay Thompson will be making his fifth consecutive All-Star appearance. As a player, Thompson is clinically effective at what he does - spot-up shooting as well as anyone, working off the ball, defending his position and utilising as few dribbles as possible, even fewer than Gobert. He is considered the perfect foil for his and any team-mates by virtue of how well he plays in his off-ball role, how flexible he is, how relatively consistent he is, and how he accepts these limitations with enthusiasm rather than complaint. If that last part sounds familiar, that will be because it is also an accurate description of Gobert. His career-best scoring mark of 15.1 points per game comes on league-leading field goal shooting among qualified players at 65.0 per cent. He is second among qualified players behind only DeAndre Jordan in true shooting percentage at 67.1 per cent; for comparison's sake, Thompson is 66th out of 128. 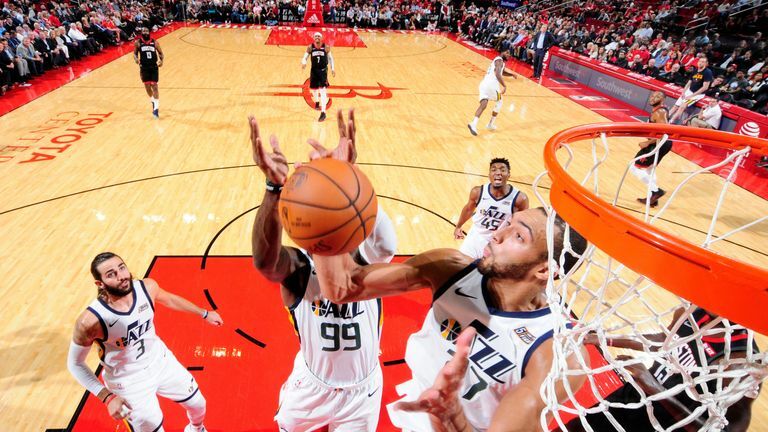 Gobert is fourth in total rebounding percentage, third in blocks per game, second in defensive win shares, and is the reigning DPOY due to his sheer deterrence factor around the rim. Screening, rolling to the rim, catching lobs, finishing, boarding and shutting down the interior are exactly what he is supposed to be doing, and he does them in combination better than anyone. What more can he do? We reward Thompson for doing what he is supposed to do and not overextending himself. Why can't Gobert enjoy the same? At worst, an anti-Gobert argument would have to be shaped around what he doesn't do. Because of the minimal touches, he is not a ball handler, nor a creator either via the dribble or in the post. He does not take jump shots in any form. He also struggles to defend the perimeter, forcing the Jazz to play a largely switch-less defensive system based around him sagging back into the paint, akin to how Portland play with the similarly laterally-slow Jusuf Nurkic. Nevertheless, to point to what a player does not do when they are not designed or asked to do it is opening a can of worms, and for no reason. For all the focus on floor spacing and shooting at every position that supposedly defines the NBA in modernity, this remains a pick-and-roll, defense-first league. And Gobert does that combination as well as anyone. One of the players who prevented Gobert from the All-Star spot was San Antonio Spurs big man LaMarcus Aldridge, who will be making his seventh All-Star game appearance. In contrast to Gobert, Aldridge is predominantly an offensive player. He is averaging 21.2 points per game this season, on course for the seventh season of his career in which he averages more than 20 per game, and has a career-mark of 19.5 per game over 924 regular season contests. He is also scoring more efficiently this season than ever before, with a slight uptick in his free throw rate leading to a 57.5 per cent true shooting percentage, against a career-mark of 54.0 per cent. Aldridge is the noted halfcourt offensive specialist, someone to whom you can give the ball in the paint, high post or left elbow, and expect him to get something good away no matter how little ball or man movement there is around him. Gobert is the noted half court defensive specialist, who can body up any opposing Aldridge type and track the snaky drives of any opposing guard. It is from this stark contrast that we find the origin of Gobert's frustration - the idea that in not picking him, the NBA collectively is not properly valuing defense. Maybe that is true. Maybe we would be as willing to anoint Rudy Gobert (as well as perhaps Oklahoma City Thunder center Steven Adams, himself 12th in win shares) as All-Star players as we are Aldridge and Karl-Anthony Towns types if defending had the glamour and measurability of offense. It is largely impossible to prove either way, yet Gobert's omission is a strong piece of evidence for the prosecution. That said, an argument that is pro-Gobert need not automatically be an argument that is also anti-Aldridge. After a very poor first two months on the season, in which he shot poorly yet often and did not impose on defense, Aldridge hit his stride in a big way. Over the first 25 games of the season, Aldridge averaged 18.3 points on 45.2 per cent shooting; in the 30 games since, he has averaged 23.6 points on 56.8 per cent shooting. And as he goes, the Spurs go. Over the first 25 games, the Spurs posted an 11-14 record; over the 30 games hence, they have gone 21-9. While the NBA as a whole has projected towards three-point shooting big men, Aldridge has rejected the idea. While so many of his contemporaries have turned their mid-range jump shots into threes, Aldridge has stuck to the mid-range areas that have long defined his game, and in doing so, he has become the exception to the rule. The player who does not fit into the usual game plan. The anomaly, rather than the predictable. Furthermore, while Aldridge is mostly considered to be an offensive player, he is not a complete absentee on defense. In looking at the Spurs' defense last month, we saw a mid-season turnaround not unlike Aldridge's offensive one above, and Aldridge is a part of that. He is not the rim protector that Gobert is, to be sure - almost no one is. And like the Frenchman, he also struggles when asked to step up to the perimeter. Yet for all his reputation as a dispassionate defender, Aldridge is not a bad protector around the basket - he cannot and does not get to as many shot attempts inside the paint as a true deterrent like Gobert, but those he does get to, he holds to 53.6 per cent shooting. Do you believe Rudy Gobert should be an All-Star? Me too. Defense matters, and he is as good in his role as it is possible to be. Arguments based around his omission being a product of playing in Utah are probably legitimate, if impossible to prove. To leave him out is a mistake, and an unexpected one, given that the reserves are chosen by the very same coaches supposed to value highly that which Gobert brings. But in our discussion of the fairness of that, let us not overlook the play of Aldridge. Over the last two months, he has been as good as almost anybody. ​​​​​​Want to watch the NBA but don't have Sky Sports? Get the Sky Sports Action and Arena pack, click here. Play amazing courses on PC, tablet or mobile!